Does Eating Red Meat Increase Your Chances of Dying Prematurely? Eating red meat alone does not cause premature death. It could be a contributing factor to heart disease and cancer, which are the leading causes of death in the United States. Research has shown that over the last 20 years eating habits (diets) as well as other life style habits including smoking, unhealthy weight and inactivity also have significant impact on these diseases. Red meat is high in saturated fat. Eating diets high in saturated fat increase your LDL cholesterol, which increases your risk of coronary disease. What are the best diets? The top ranking diets for 2012 were listed as the Dash diet for overall diet and healthy eating along with the TLC Diet coming in second and the Mediterranean diet following as third. All three plans emphasize abundance of plant based, low fat, and high fiber foods. The Dash diet is rich in fruits, vegetables, whole grains, nuts, beans/legumes and seeds providing vitamins, minerals, micronutrients and antioxidants, which all protect against major diseases such as heart disease and cancer. Also, diabetes research has shown an improvement in blood sugar control with a more plant based eating pattern. Healthy eating recommendations within the last 20 to 30 years are the same as the new ChooseMyplate guidelines: eat vegetables, fruits, whole grains, low-fat dairy products, and lean protein foods because they contain the nutrients you need without too many calories. Fruits and vegetables are great sources of fiber, vitamins, minerals, low in fat and calories, low in sodium and no cholesterol. For grains choose whole grains high in B vitamins, iron and fiber, and low in fat. Try to avoid baked goods like pastries and croissants, which contain solid saturated fats. Protein sources advised are fish, chicken, turkey, dried beans and nuts, which are better choices than red/processed meats. The best way to cook the meat is to trim the fat off, bake with no skin, broil or grill. For the most healthy living manage your weight, control your portions, plan your meals ahead of time and use fresh foods like fruits, vegetables, good monounsaturated fats and whole grains. Sounds just like the Dash and Mediterranean diets! Keep in mind that you should not constantly think of dieting when it comes to food. Don’t focus on what foods you should avoid, but focus on what foods you should include in your daily diet. Make life choices with your diet because most foods can be enjoyed if eaten in moderation. Looking for new and healthy recipes? Check out the Speaking of Women’s Health Recipe Box. 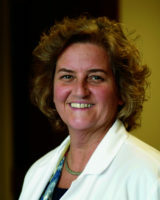 Peggy Zeller is a dietitian and nutrition educator at Cleveland Clinic. Zeller provides nutrition counseling at Cleveland Clinic’s Solon and Beachwood Family Health Centers, conducts various health talks and actively supports community health fairs.